Classes marked * use the Yoga Loft Class Card: $72/6 classes, $120/12 classes, $15 drop-in. Round Robin is taught by various teachers; each will bring their own unique twists on yoga to the class. This is chance for you to explore the variety of teachers the unique skills they have to offer. You may experience Vinyasa, Yin, Restorative, Hatha, Iyengar, Nidra or some other style of yoga! This practice is about being present and curious about yoga and all it has to offer. ​A focus on mindfulness and breathing brings stillness and total relaxation to body and mind. Props will be used to support the body in postures, which are held for extended time. Restorative yoga centers the self and for the upcoming week. You will experience classes with a variety of experienced yoga professionals who can modify poses for every body and offer their own unique twist on this practice of self-care. Teachers in rotation are Kelly Burnham, Alison Brant, Sarah Oakley, and Sarah Scafidi-McGuire. Contact Kelly for more information. View calendar for scheduled teacher. Link movement and breath in this energizing practice. Complete sun salutations and various standing and seated postures. Try some inversions and enjoy deep relaxation. Fast paced to get your body warm and stretched out. Feel the flow and feel great. All levels welcome. An energetic practice to build strength and vitality. Prepare to work hard and enjoy a deep relaxation at the end. All levels welcome. Centering, warm-ups, preparatory poses, classic yoga postures and resting poses are described and demonstrated in detail. Students will be guided and assisted in postures leading to greater awareness, stability, strength and flexibility. This class is appropriate for both beginning and experienced students desiring to focus on a personal yoga practice. The exploration of pre-asana and yoga poses continues with the addition of some intermediate asana, refinement of alignment, and introduction to simple vinyasa, flow between poses with the breath. Continued development of the balance between strength and flexibility, muscular engagement and relaxation is emphasized. For kids walking to age 5, with a caregiver. A mix of movement, music, and stories based in yoga. Class starts with an "om" and ends with a craft. Fun for both kids and adults. Special pricing of $55 for the 6 weeks if preregistered by 1/5/19. Focused on miofascia release through a series of self-massage movements using YTU(R) therapy balls, we will engage in warm up asana flows to prepare our bodies for the peak pose of the class. 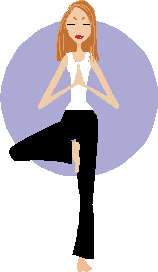 Each class will have one particular peak pose goal: shoulder stand, pigeon pose, monkey pose, half-moon pose, bridge pose, camel pose, etc. The whole practice will be dedicated to preparing body and mind towards achieving the maximum benefit of each chosen pose of the class. All levels welcome. Plenty of props will be used to help achieve proper body alignment and safety. Minimum of 3 participants required for class to run. Sign up early for discounted rate of $55.00. Contact Cintia to register. Yoga Tune Up(R) is a yoga therapy modality focused on the three Ps: posture, pain, and performance. This class is recommended for adults who want a targeted practice with individual tailoring to mobility and range of motion conditions that may preclude them from attending a regular yoga class. Props and therapy balls will be used for fascia conditioning and an extensive pratapana (warm up) will precede any pose prescribed during the practice. Ashtanga Primary Series is a set of predetermined postures linked together into a flowing sequence (vinyasa) using the breath. This invigorating practice heats and purifies the body, improving health, flexibility, strength, and coordination. We will begin with sun salutations, and move through standing and seated postures, back bends, and inversions. All levels of yoga experience are welcome. Appropriate for people in good physical health. Yoga Nidra is a practice of relaxing consciously and deeply in order to make connection with our inner self. This connection will lead us to discover the potential for peace, healing and clarity that is already within us. The class will begin with gentle yoga movements to prepare the mind and body for the restorative part of the class where the students will lie quietly on their mats and respond to soothing and empowering relaxation techniques and visualizations spoken by the instructor. Beginners welcome! Take time moving in and out of postures as they flow from one to the next. Find your way into each posture with refinement and strength. We will warm the tissues with slow flow and then safely melt into stretches for the release of deep tensions held in the body. Feel enlivened and refreshed as you head into your weekend! Class will be taught alternately by Liz Haney and Kelly Burnham. The Yoga Loft is delighted to offer a selection of yoga classes appropriate for people over fifty. 50+ Active Yoga is for those who are active and in reasonably good health; 50+ Gentle Yoga is geared to those who have mild to moderate physical limitations. Floor, seated, and standing poses are included in all sections. Flexibility NOT required for great benefit. Beginners always welcome. Use class card or $15 drop-in. Enjoy a complete body-mind workout. Each class begins with a meditative warm-up, continues with an energetic sequence of classic yoga postures, and closes with a guided relaxation to bring deep stress relief. Safely build strength, endurance, balance & flexibility. FEEL GREAT!! Beginners welcome. to all mothers, whether new or experienced in yoga and is appropriate from about 4-6 weeks postpartum until baby is crawling. Use class card or $15 drop in. Prenatal yoga is a beautiful and powerful way to honor your pregnancy as you prepare for a profound rite of passage - birthing into motherhood. Safe for and open to mothers in all stages of pregnancy and all levels of yoga practice. The gentle practice of Qigong nurtures your internal energy, bringing beauty, grace, and power into your movement and tranquility and happiness to your mind. In this class we will learn the secret to stillness without rigidity and relaxation without collapsing, through gentle opening of the joints and easy-to-learn dynamic movement exercises, interspersed with sitting, standing, and lying down meditations and energizing agility training. This class lays the foundation for a daily at-home Qigong practice for improved sleep, balance, posture, coordination, flexibility, agility, muscle tone, grip and core strength as well as reduction in pain, tension, and physical and mental stress. NOTE: soft soled indoor-only shoes recommended for this class. Please call before coming to your first class. Warm up your Friday evenings with some hot Latin rhythms! Steps and music taken from a variety of Latin styles including salsa, bachata, merengue and samba. Beginners welcome! You will learn the fundamentals of leading and following as well as a wide variety of moves you can incorporate into both partner and individual dance. No partner, special clothes or shoes needed. Just come ready to have fun and get some great exercise, dancing to music that really makes you want to move. Belly Dance is a beautiful, colorful, expressive creative art form. This dance exercises and tones the body; rhythms capture the heart and uplift the spirit, making this a healthy, enjoyable experience for body, mind and spirit. Finger cymbals, veil work and costuming.